If you have missing teeth, it is important to replace them. When a tooth is missing, the resulting gap allows nearby teeth to tilt or drift causing more problems to your other teeth. Missing teeth can also change your bite adding stress to the jaws which could lead to difficulties eating, frequent headaches and fracture or cracking of other teeth. And due to the change in facial structure, it can also cause patients to look much older than their actual age. Implants are a great way to replace your missing teeth, and it is the closest thing to having your real tooth back. 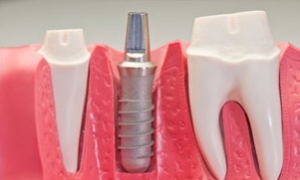 Dental implants are titanium tooth replacements surgically implanted in the jawbone that integrate with the support structure of the new replacement tooth. Other dental implant options include a fixed bridge (to replace several missing teeth) or combining implants with more convenient dentures. All of these treatments offer great functional and cosmetic results.